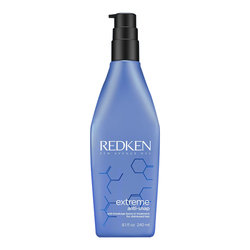 A shampoo for damaged hair or distressed hair that helps fortify your weakened strands and strengthen hair. Aqua/water/eau, sodium laureth sulfate, coco-betaine, glycol distearate, sodium chloride, dimethicone, parfum/ fragrance, cocamide mipa, sodium benzoate, hexylene glycol, salicylic acid, guar hydroxypropyltrimonium chloride, carbomer, cetyl alcohol, sodium cocoyl amino acids, behentrimonium methosulfate, quaternium- 33, potassium dimethicone peg-7 panthenyl phosphate, benzyl benzoate, sodium sarcosinate, propylene glycol, limonene, benzyl alcohol, arginine, 2-oleamido-1,3-octadecanediol, hydrolyzed soy protein, linalool, fumaric acid, hydrolyzed vegetable protein pg-propylsilanetriol, phenoxyethanol, tetrasodium edta, potassium sorbate, sodium hydroxide, citric acid (d184533/1). • Apply daily, if desired, to damp hair. Massage into a lather. Rinse thoroughly. • For best results, follow with Extreme Conditioner.